Far from any trailhead, Mt. Anna Mills lies about 6mi west of Cirque Peak and the Sierra Crest in the southeast part of SEKI National Park. It sits south of Guyot Peak across Rock Creek before the drainage begins a steep 2,500-foot drop to the Kern River. Anna Mills was the last day of the 2014 Challenge which I failed to show up for due to a stomach illness that saw me retching off the side of the Horseshoe Meadow Rd at five in the morning. I had been interested in the peak because it was the last P1K in CA over 11,000ft that I had remaining and it has been high on my todo list ever since that fateful morning. I have to admit I wasn't particularly looking forward to the outing because so much of it is on sandy trail that goes on and on for miles, tearing up my toes no matter what type of footwear I use. While I had been looking around for somewhere to spend three days I had free, just about everywhere in the state was forecast for very hot weather. Horseshoe Meadow seemed the lone exception with temps forecast for the mid-70s at 10,000ft. So I put the Anna Mills dayhike on the menu and headed to Horseshoe Meadow on a Tuesday evening. I wouldn't get there until well after midnight, but with a nap in the afternoon and five more hours of sleep at the trailhead, I was good to go at 6a the next morning. The hike out to Anna Mills was much like I expected, having traveled much of the trail portion on previous outing to Guyot and Joe Devel/Pickering in years past. The sandy portions were long and annoying much as I had remembered them, perhaps more so. On the other hand, it was a beautiful day with blue skies and nice temperatures. Once over Cottonwood Pass the views open up across the Boreal Plateau, Big Whitney Meadow, and then over Siberian Outpost. The meadows looked mostly dry and brown, about two months ahead of their normal summer schedule. In passing Chickenfoot Lake I saw a lone figure standing over the lake with a cup of coffee, enjoying a late morning rise. I saw no one on the trail until I was well inside SEKI and onto the PCT heading, through Siberian Outpost around 9a. They were riding horses, guiding a packtrain out of SEKI. We exchanged greetings as I stood off the side of the trail to let them pass. An hour later I left the trail where it started to curve north and drop towards Rock Creek. I had planned to bring only a single quart of Gatorade and fill up along the way but at the last minute I threw in a second quart, "just in case." Good thing I did too, because both creeks I crossed on my way to Anna Mills (Siberia Pass Creek and one in Forgotten Canyon) were bone dry. I would have to stretch out the two quarts until I returned to Chickenfoot Lake in the afternoon. The cross-country travel to Anna Mills was not difficult, but there were a few boulder fields that slowed one down if a route wasn't found around them. I did better on the way out to avoid them. From a distance, the East Slopes of Anna Mills look steep and tediously sandy but the footing turned out to be surprisingly good. Unlike some of the other summits in the area (Guyot and Joe Devel come to mind), Anna Mills is not the pile of sand one might expect. I reached the summit around 11:30a, taking just under 5.5hrs. I found a small collection of antennae near the top, somewhat to my surprise for a peak so remote. At 12,000ft+, the summit provides fine views across Sequoia National Park. To the west across the Kern River Canyon is the forested Chagoopa Plateau framed by the higher Kaweah Ridge Peaks behind it. 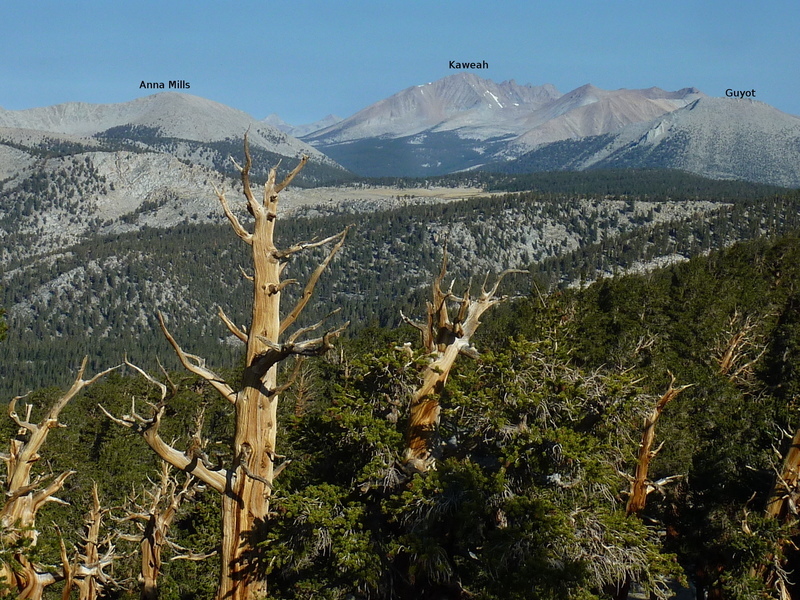 To the east is the Sierra Crest dominated by Langley and Cirque, Olancha rising far to the southeast. To the north is Guyot Peak with the Kings-Kern Divide in the background. A register box found at the summit contains an older Andy Smatko scroll from 1985 (his effort to name the peak after a combination of his and his companion's names was for naught) as well as a more convenient notepad left in 1997. There were almost 30 pages of names all told suggesting 1-2 parties per year on average. The last signatures were those from last year's Challenge, all squeezed onto the bottom half of a page. Wanting to leave my entry among theirs, I wrote in the small amount of available white space to the right so I could join them in spirit, at least.